KDE Project Ships Second Beta Release for Leading Free Software Desktop, Codename "Cartoffel"
With the second beta, the KDE community focuses on stabilizing its codebase. September 6, 2007 (The INTERNET). The KDE Community proudly presents the second Beta release for KDE 4.0. This release marks the beginning of the feature freeze and the stabilization of the current codebase. Simultaneously the KOffice developers have released their third Alpha release, marking significant improvements in this innovative office suite. Both KDE and KOffice have benefited from the Google Summer of Code, as most resulting code has now been merged. Since the libraries were frozen with the first Beta, KDE developers have been adding features and functionality to their applications. Now it is time to start polishing these features; writing and translating documentation, improving the usability, and completing the artwork. As KDE 4.0 is feature-frozen now, going into bugfixing mode, major ideas and changes will be held off until 4.1. However, some KDE components, such as Plasma, are exempt from this freeze and will still see significant improvements. Many parts of KDE have seen improvements over the last month, not least thanks to the inclusion of the results of the Google Summer of Code. In the following sections, we will highlight some of the most visible changes and improvements. Long time KDE developer Daniel M. Duley (a.k.a. Mosfet) rejoined us. He has been working on Blitz, a graphics library designed to fill the gap in the KDE libraries whilst we wait for Zack Rusin's Quasar. He introduced himself and his work (again) in the Commit Digest. And it is not just Blitz which is on his mind, he is working hard on high performance, yet easy to use graphical tricks for the KDE developers. Another basic component of the KDE libraries also received some attention. Mickael Marchand spent some time on Kconfig, the configuration system for KDE. When committed, his work will enable support for several different backends for the KDE configuration, including a SQL database. Meanwhile, several developers immersed themselves in providing better support for *BSD and OpenSolaris in KDE. And Strigi now has XESAM support. XESAM is an effort initiated by the strigi developers, and now continued on freedesktop.org with the purpose of creating a cross-desktop interface for searching and metadata-usage in applications and tools. Marcus continued to work on the Avogadro 3D molecule visualisation library and its integration in Kalzium. Chemical data is in good hands on the KDE desktop these days, seeing how also Strigi also received support for chemical files. Sebastian Pipping spent a lot of time on Kate, KDE's advanced text editor (or lightweight Development Environment). He improved the way search works in Kate, both making it more powerful and easier to use. Now the component used in Kate to edit text is used throughout KDE for pretty much every text input widget you see, thus applications like Kwrite but also Konqueror will benefit from these advancements! Another area where Kate inspired some improvements with broad effect is the plugin dialog. This was initiated by Rafael Fernández López? who started to improve it, and then integrated his work in other applications like Kopete. Many comments on his work were made, especially on his blog, and work is still going on. He did get some help in the coding area, and on his blog you can see how many tried to help him improve the plugin dialog. The applications have received a lot of attention from their developers. 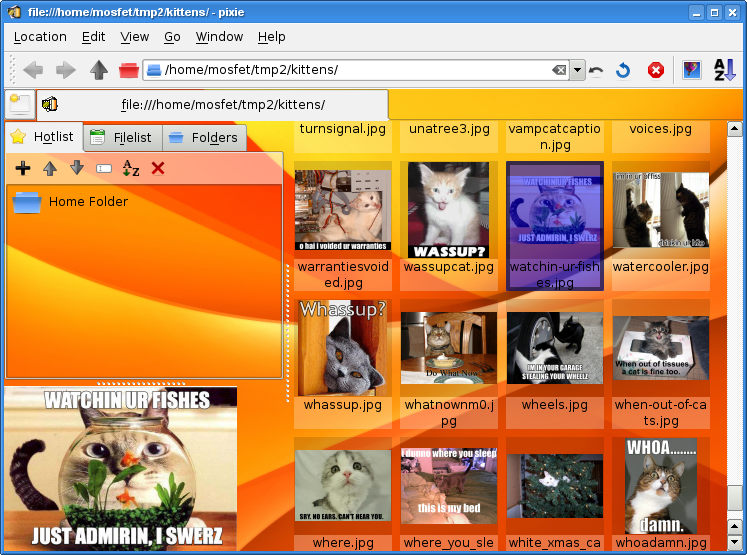 For example, Kolourpaint saw many features merged. And not only has it seen usability work and new effects, but the application has become a lot more robust. Better handling of text, improved scanning support and session management are just a few things that have been improved in this easy-to-use image editor. Our old and trusted KGPG got some love, in the usability area but also concerning features. And Okular received further usability work. Amarok saw integration with plasma, where plasma will provide the infrastructure for the now much more central Context View. Imagine the ability to drag'n'drop items from the context view on the desktop or to and from the panels on the side of the screen! A big, visible bulk of application and infrastructural work was added to KDE when the Google Summer of Code students added their work. We will go through some of these additions, but if you want to read more we recommend the dot article about the KOffice SoC results and the excellent interview series with Summer of Code students on People Behind KDE, starting here. Bertjan Broeksema has spent his summer working on KPilot. His mentor, Jason 'vanRijn' Kasper mentioned on his blog how this work lead to a much improved infrastructure and a port to KDE 4, allowing the other developers to integrate new features and leverage frameworks like OpenSync. Meanwhile, the other KDE PIM applications also received some love. KOrganizer had Mike Arthur working on better blog support and Loïc Corbasson improving the look and feel. Urs Wolfer's work on KRDC, the KDE Remote Desktop Client is finished as well. Making use of libraries ensures the application's maintainability in the long run. Coupled with new features like a tabbed interface and much improved configuration, users can count on a greatly improved remote desktop experience in KDE 4.0 -- and beyond, as Urs is comitted to continue working on it! Juan Gonzàlez Aguilera also spent time getting some older tools freshened up, focusing on Bluetooth support in KDE. The KDE education project received exciting work on step (the KDE physics simulator) by Vladimir Kuznetsov and on Kalzium by Marcus Hanwell. You can check these cool videos out if you want to see more. Further work was done on Kopete, KWin and more applications. The Google Summer of Code page has more complete information. The following months will see fanatical work to stabilize the KDE applications and libraries, and the finishing touch on the components not yet frozen. Two further beta's are planned, after which KDE will be frozen for a release candidate cycle ending in a release planned around Christmas at the end of the year. For those interested in getting packages to test and contribute, several distributions notified us that they will have KDE 4.0 Beta 2 packages available at or soon after the release. The complete and current list can be found on the KDE 4.0 Beta 2 Info Page. Along with KDE 4.0 Beta 2, KOffice releases its third alpha version. This version is getting a bit more mature and usable, but still counts as a technology preview. This way, the public can catch a gleam of what is coming in KOffice version 2.0. It does not have the same level of maturity as the rest of KDE 4.0 Beta 2. Much work has been done on the basics, like shape loading in KPresenter and KSpread, porting some filters for Karbon, improvements in KChart2 and stability and usability work across the board. There was time for other improvements as well -- for example, frames can now have a text runaround which is completely changable using the vector tools, which is great for images in KWord. Kexi is not only ported to Qt 4, but the developers are already including new features like a tabbed toolbar (video demo) to improve user's experience in a new way. Although KOffice is included in KDE 4.0 Beta 2, it has its own release cycle, and the first version of the KOffice version 2 series is expected around the new year 2007-2008.